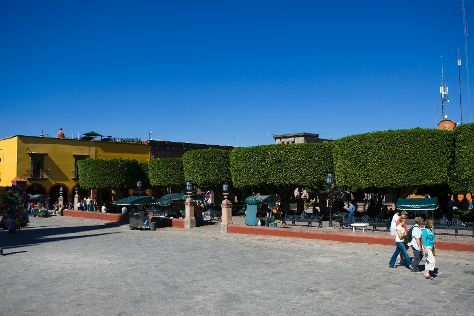 Recognized as a World Heritage Site, Guanajuato spills over hilly terrain in central Mexico, luring visitors with its pleasant tree-shaded plazas and friendly sidewalk cafes. Start off your visit on the 2nd (Sun): browse the exhibits of Diego Rivera Museum and Home (Museo Casa Diego Rivera), get engrossed in the history at Alhondiga de Granaditas, then take in the spiritual surroundings of Basilica of Our Lady of Guanajuato, and finally take an in-depth tour of Museo Exhacienda San Gabriel de Barrera. To see photos, more things to do, reviews, and more tourist information, read our Guanajuato online trip planner . Phoenix, USA to Guanajuato is an approximately 8-hour combination of flight and taxi. You can also do a combination of bus, flight, and taxi; or drive. You'll lose 1 hour traveling from Phoenix to Guanajuato due to the time zone difference. Traveling from Phoenix in June, things will get much colder in Guanajuato: highs are around 84°F and lows about 61°F. Cap off your sightseeing on the 2nd (Sun) early enough to go by car to San Miguel de Allende. On the 3rd (Mon), examine the collection at La Esquina Mexican Toy Museum, appreciate the extensive heritage of El Jardin, then admire the landmark architecture of Parroquia de San Miguel Arcangel, and finally make a trip to Zocalo. To see other places to visit, maps, where to stay, and more tourist information, you can read our San Miguel de Allende trip builder site . Traveling by car from Guanajuato to San Miguel de Allende takes an hour. In June in San Miguel de Allende, expect temperatures between 84°F during the day and 57°F at night. Wrap up your sightseeing on the 3rd (Mon) early enough to drive to Queretaro City. With a World Heritage-listed town center, Queretaro offers plenty of colonial charm appealing to visitors looking to add a bit of history and culture to their vacation. On the 4th (Tue), don't miss a visit to El Acueducto De Queretaro, admire the striking features of Casa de La Corregidora, examine the collection at Museo Regional, then take in the architecture and atmosphere at Iglesia de Santa Rosa de Viterbo, and finally contemplate the long history of Plaza de Armas. To find more things to do, ratings, maps, and tourist information, go to the Queretaro City attractions planner . Traveling by car from San Miguel de Allende to Queretaro City takes 1.5 hours. Alternatively, you can take a bus. In June, daily temperatures in Queretaro City can reach 84°F, while at night they dip to 57°F. Wrap up your sightseeing on the 4th (Tue) early enough to travel to Ezequiel Montes. Ezequiel Montes is a municipality in the Mexican state of Querétaro. On the 5th (Wed), do a tasting at De Cote Casa Vitivinicola, then do a tasting at Finca Sala Vive by Freixenet Mexico, and then learn about winemaking at Vinedos Azteca. To see photos, ratings, more things to do, and tourist information, you can read our Ezequiel Montes online trip itinerary builder . Traveling by car from Queretaro City to Ezequiel Montes takes 1.5 hours. June in Ezequiel Montes sees daily highs of 84°F and lows of 57°F at night. Finish your sightseeing early on the 5th (Wed) so you can travel to Mexico City. Get a sense of the local culture at Frida Kahlo Museum and Palacio de Bellas Artes. Museum-lovers will get to explore National Museum of Anthropology and Museo del Templo Mayor. The adventure continues: explore the ancient world of Zona Arqueologica Teotihuacan, enjoy breathtaking views from Torre Latino, ponder the world of politics at National Palace (Palacio Nacional), and appreciate the extensive heritage of Historic Center (Centro Historico). To see more things to do, other places to visit, traveler tips, and more tourist information, refer to the Mexico City travel route builder site . You can drive from Ezequiel Montes to Mexico City in 3 hours. Traveling from Ezequiel Montes in June, expect nights in Mexico City to be about the same, around 57°F, while days are a bit cooler, around 76°F. Wrap up your sightseeing on the 8th (Sat) early enough to travel back home.